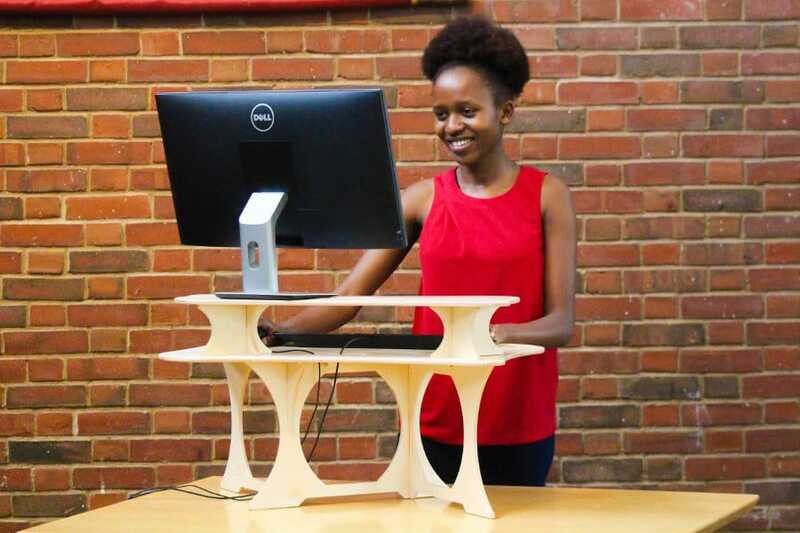 StandStand is a company that was funded by Kickstarter in 2014 and shortly after began selling a small range of highly-portable standing desks. 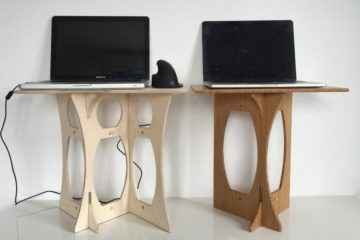 I have here a couple of these really cool desks, the original StandStand de luxe, and the StandStand mouse. I have been testing these out for the past few days and I’ve got to say, for a simple and small product, they certainly are enjoyable to use and I definitely can see the ergonomic benefits they bring. Stability is surprisingly one of the best features of the desk, as well as the most obvious: the fact that it is super lightweight and portable. One thing that I always like when receiving a new product is actually taking a look at how it is packaged and assembled. It is often the small things and attention to detail that can ultimately make a product better or worse, and the packaging is usually a good indicator. Well, the StandStand goes above and beyond in my opinion! It’s clear to see that a lot of thought has gone into the assembly and I’ll go through a few of the things I loved the most. The desks are well-packaged in the colorful branded boxes that are designed to be re-used. Given the fact these desks are highly portable, you’ll most likely be mounting and dismounting them regularly. The box looks sturdy and good for long-term storage or just protection as you move from one place to another. It even has holes exactly where the desk does and you can carry the desk like a small briefcase. On top of this, the box comes decorated with useful information like a size chart and assembly instructions – the assembly we’ll get to soon and you’ll see how easy it is. 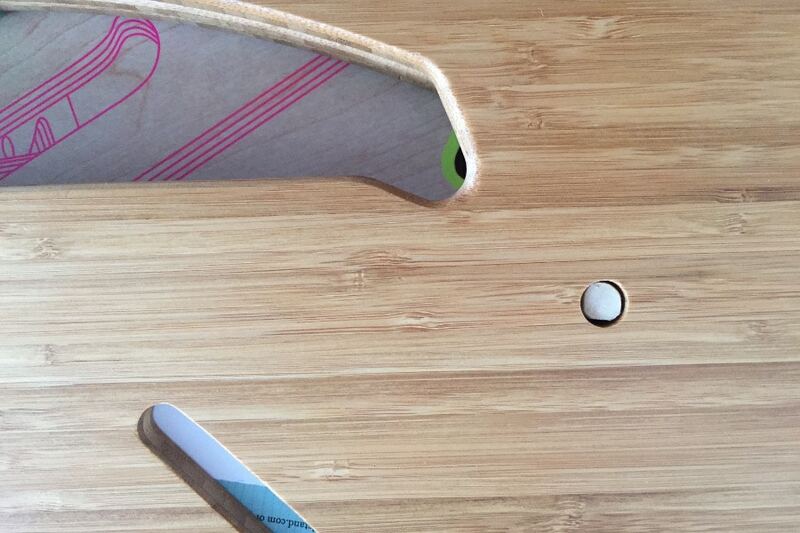 Here you can see the small hole with a notch to keep the flat pack together. Watch out IKEA you have competition! The desks both came as 3 or 4 separate pieces flat-packed into a small rectangle inside the box. Now this in and of itself is not that impressive but what I really liked were the small holes and notches which make sure everything stays nicely together. 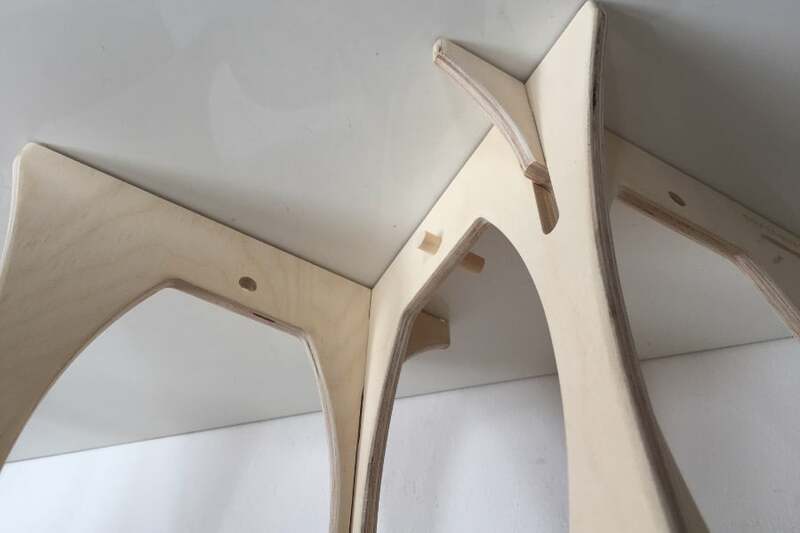 These notches are not used when the desk is assembled so it is purely for the transport and packing purposes, and it is this sort of attention to detail that I love. The small attention to detail doesn’t stop there! 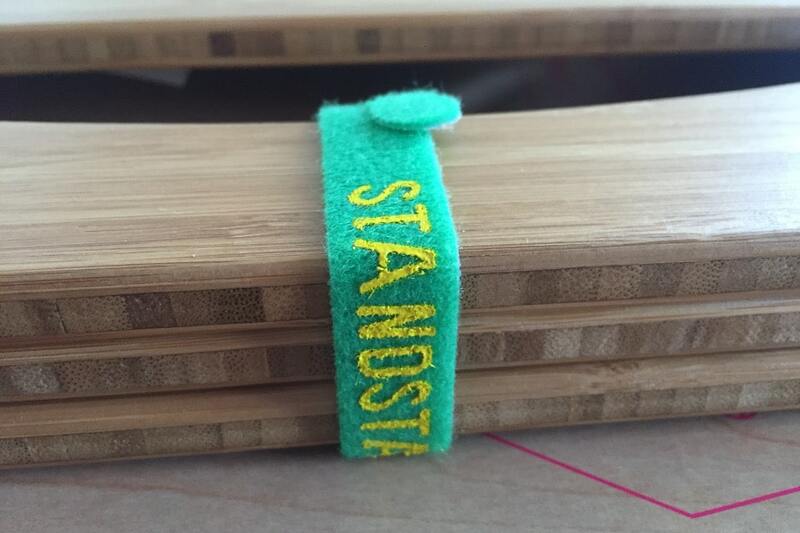 There is also a small branded velcro strap that wraps around the “handle” of the flat-packed desks, to make 100% sure that the pieces are safely locked together. And finally, there is a nice thank you note from the company which has more instructions, and some small table protectors (small rubbery pads that can be stuck beneath the desk). As you can see from the photos, I have got two slightly different products. 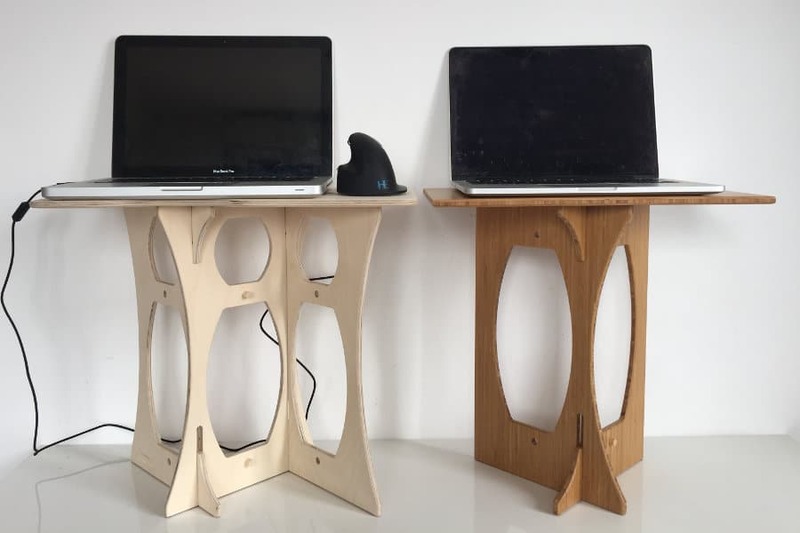 One is the smaller StandStand – at a shave under 16″ across it is designed as a simple laptop standing desk. The StandStand Mouse is around 19″ wide and has an extra “leg” giving is slightly more stability and extra room to use a mouse. It is pretty clear to see from the list above that the pros far outweigh the cons! Let’s take a look at each of these a bit more closely to see what the features are. 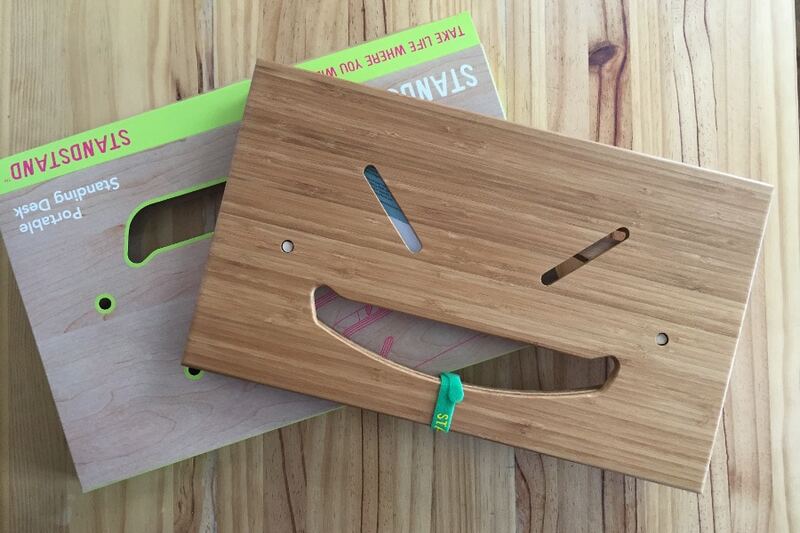 The portability comes from the fact that it is just 3 (or 4 ) pieces of lightweight wood designed to slide together. Here you can see how these pieces connect to make a strong surface for your laptop. The StandStand is by far the most portable standing desk that we know of. The only one that maybe compares is the Spark standing desk by Ergotron, but this desk is made from cardboard and is not really in the same league as the StandStand products. The StandStand weighs between 1.6 – 2.8 lbs (depending on the height you choose), and the StandStand Mouse weighs in at 2.5 – 3.3 lbs. This is small enough to fit in your bag to take to work (or even to the cafe like in the video above). 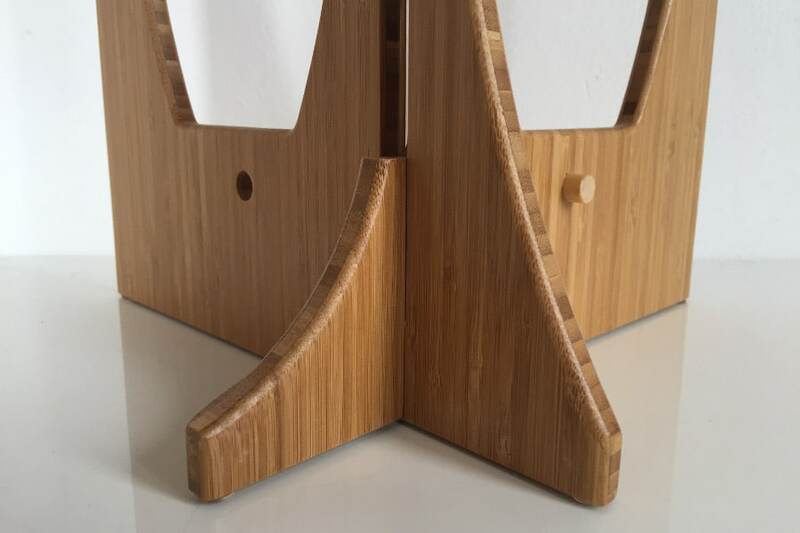 Here you can see the two materials, birch and bamboo, side by side. I have one of each type here with me, one in birch and one in bamboo. I have to say from personal preference, I love the bamboo finish! It is a little bit more expensive, but for the look and feel I think I’d pay a little extra. 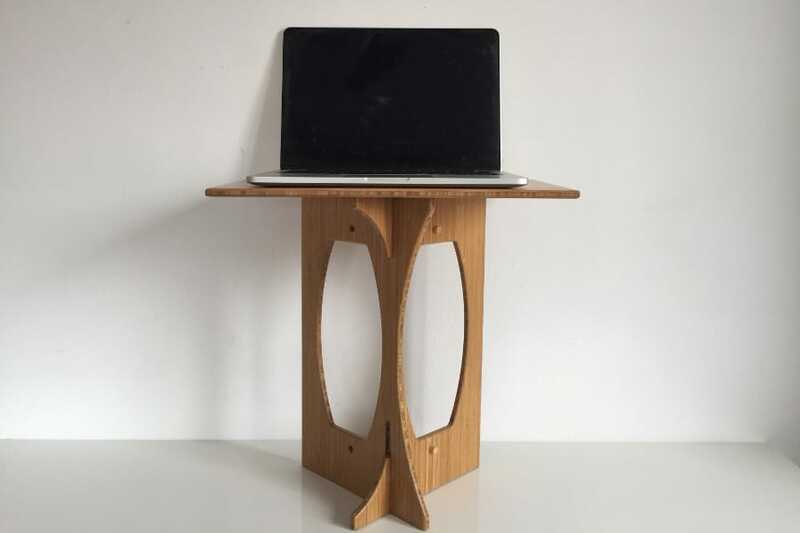 Bamboo is becoming much more popular in standing desks, with other desks such as the Fully Cooper and the Uplift desk both offering bamboo desktops. That being said, the birch is also very aesthetic, and at a cheaper price, I can see why it is so popular. Most importantly though, both these materials are extremely lightweight (great for portability! ), and also sustainable materials – so your eco-friendly conscience can remain at ease. You can see here how the base fits together. Despite no glue, nails, or screws the desk is extremely stable. One thing I must admit I never thought I’d say about these desks before I got them is that they are really stable! Now I’m not saying that you should go and put a full desktop computer on them, but for work with a laptop, I was very surprised with how little movement there was – especially given that there are no screws, bolts, or nails holding it together. If you put some force behind it, there are some smalls twists and wobbles, but it holds up better than expected when just working at a laptop – and I certainly felt comfortable resting the weight of my arms while using the mouse too. 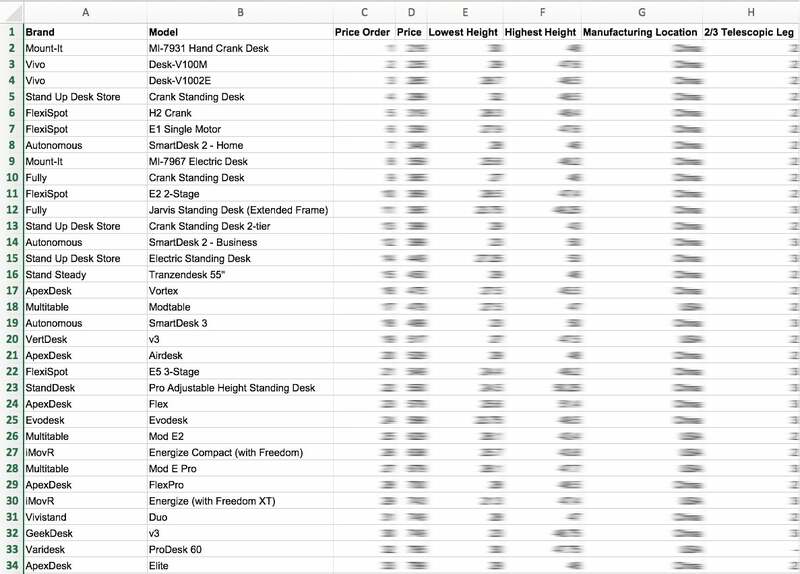 Here is the StandStand 16″ desk fully assembled. I really like the aesthetic design. Not only do you have the choice between the Mouse or the Original StandStand, there are also 4 height options to choose from. These options mean that almost anyone can use these desks. I am 6’3″ tall and therefore got the 16″ desks, and I felt super comfortable while using them. I think this larger size would be fine for someone up to as tall as 6’6″ even. I say 30 seconds, because that’s about how long I took the first time round. 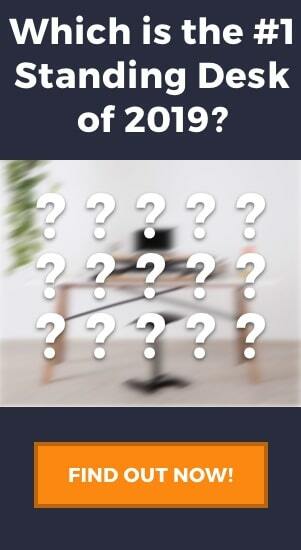 As you’ll see in the video below you can probably get the desk set up in under 10 seconds with some practice! The main benefit that I saw while using it was how great it felt for my arms. If you have read some of my other posts, you will know that for me the wrist is one of my weak points, so having good elbow and hand posture (determined by a good desk height) was a huge benefit for me. 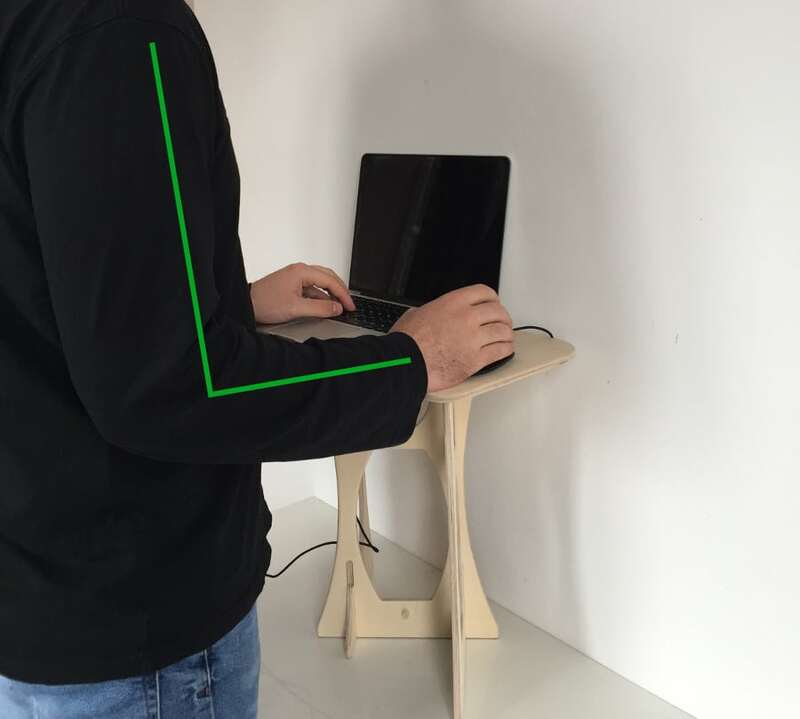 The height of the desk was perfect for my arm posture – alleviating stress from both my elbows and wrists. 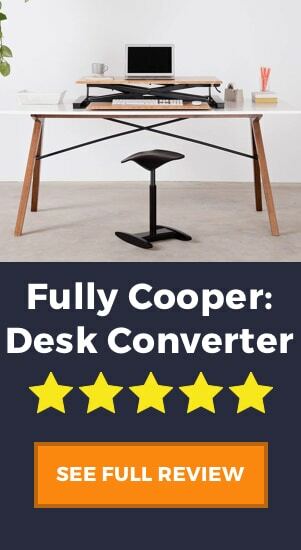 In all honesty, it was actually not easy to find any cons of this product as I have really enjoyed using both the desks. One thing that I would say, however, is that the desk is not the perfect solution for extended use (i.e. using it in an office for 4+ hours per day). I think using it as a portable standing desk when you need a break from sitting is a great option, and I will personally be using mine when I go on a business trip or want to work remotely from a cafe or shared office. My only concern for extended use is the posture of the neck and head. Now, this isn’t a fault of the product, but a fault of laptop use in general (but since these desks are primarily for laptop use then you can connect the dots). I recommend looking at our article that explains how to best use a laptop in order to avoid injury and strain that they can cause. If you are looking for something more permanent, although less portable, then take a look at the StandStand Grand. Its additional level allows you to add a monitor and will improve your neck posture while working. 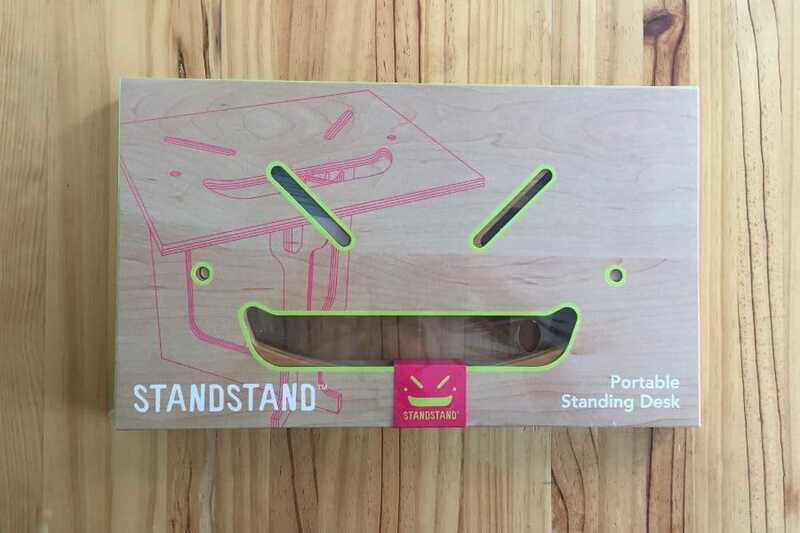 There is actually a StandStand product that I would see as a full-time solution (i.e. someone who wants to work 8 hours per day standing) is the StandStand Grand. The Grand has room to add a monitor as well as your laptop, and you can therefore adjust the height of the screen to improve your neck and head posture. Overall I’m really happy with both the products and would highly recommend them to someone looking for a very portable standing desk. The portability is obviously the best feature of the desk, and I think there is no other desk on the market that can compete in this domain, but not only that it has a great build with attention to detail and this means it has overall fantastic stability. For use on the go with a laptop, I would recommend this product over all others! For this reason I’m going to give them both a solid 4.5/5 rating.